Numerous national studies have indicated that Americans suffer from a lack of financial literacy. Beyond the basics of balancing a checkbook (20th century) to understanding fees on debit and charge cards (21st century), Americans are not particularly wise in the ways of handling money. Investors who place funds in a defined contribution program are handing those funds over to a fund manager; it is part of the fund description. In so doing, many investors do not pay close attention to how those funds are invested and what allows those funds to grow. According to Spectrem’s new DC Participant Insight Series study Educating Defined Contribution Participants, there is a frightful lack of education about investing among investors who participate in defined contribution plans. While those investors get a great deal of information regarding the benefits of saving for the future, the lack of education about investments raises all sorts of questions about whether these DC plan participants understand how their contributions manage to grow, and what they are investing in when they agree to make a contribution. A remarkably high 52 percent of DC participants claim to be not very knowledgeable or not at all knowledgeable about finance and investing. These are people who are investing, by putting funds into a defined contribution plan. But they admit they do not know much about how investing works. The lack of knowledge among defined contribution plan participants could be a result of a lack of education. Only 15 percent of DC participants have ever taken a financial literacy course, in high school, college or elsewhere. That percentage is consistent through age groups, although 22 percent of males say they have taken such a course to just 9 percent of females. 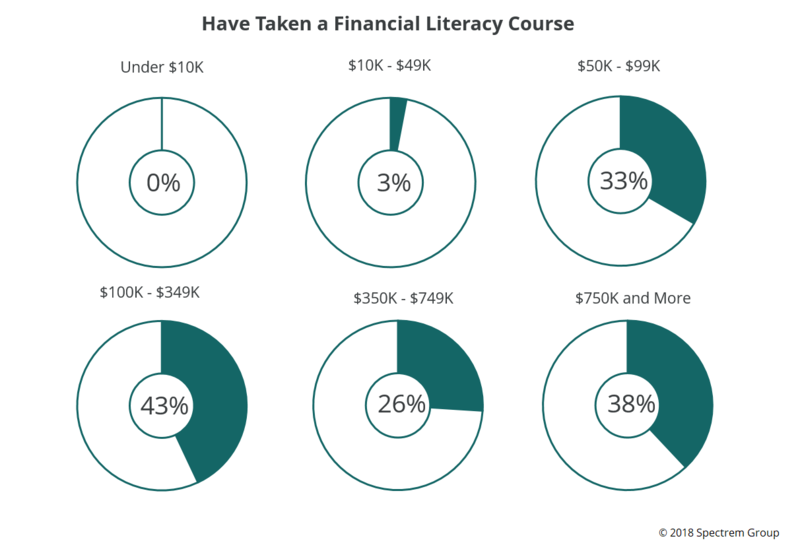 Even if male defined contribution plan participants are more likely to have taken a financial literacy course, 22 percent is still a tiny fraction of the population of DC participants. The greater the account balance in the DC plan, the more likely the investor has taken a financial literacy course. For example, 38 percent of DC plan participants with an account over $750,000 have taken a financial education course. The question, however, is whether the education came first, or the large account did. The investors surveyed for the DC study were given a financial literacy quiz to determine the extent of their financial and investment knowledge or lack thereof. It did not go well from an A grade to F grade standpoint. Considering a C grade to be 70 percent correct and a C grade to be the lowest possible “passing’’ grade, only 20 percent of defined contribution plan participants “passed”. In fact, 68 percent of the investors answered fewer than half the questions correctly. The test results were also segmented, and younger investors performed the most poorly, with 75 percent failing to answer half the questions correctly. Perhaps more telling was that 81 percent of female DC plan participants answered fewer than half the questions correctly. It is not the job of financial advisors to complete a financial literacy education program for investors who perhaps should have learned some of the material in high school or college. But it would be beneficial for investor clients to understand some of the terms advisors use to describe investment products, and it would be beneficial to financial advisors for their clients to understand what they are investing in when they make defined contributions. Advisors can explain to investors how to contact their plan sponsor in order to have a better idea how their funds are being invested. That information can then be shared with their advisor.